Captain Scarlet Classic Spectrum Saloon CarFans of cult TV show Captain Scarlet and the Mysterons, the follow up to Gerry Andersons spectacularly successful Thunderbirds series, might be surprised to learn that the series celebrates its 50th anniversary this year, having rst appeared on screen in 1967! 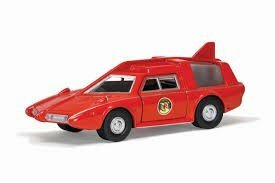 To celebrate 50 years of the indestructible Captain were proud to re-introduce a special edition of Captain Scarlet Classic Spectrum Saloon Car in commemorative packaging.The Spectrum Saloon Car is a five-seater vehicle available for use by all Spectrum personnel. An 18 ft (5.48 m) long independent four wheel drive vehicle capable of speeds up to 200 mph (322 kmph), the SSC is powered by a gas turbine situated under the rear floor. Hot gas from the combustion chamber drives compressor and power turbines before being ejected through the rear grill.The car's bodywork is made from lightweight resilient Fleetonium alloy fitted to a specially strengthened chassis with the main rib following the contour of the vehicle as a safety measure in case of overturning. The nose is strengthened for use as a ram and the tyres and the windscreen are all bullet proof.The car is equipped with powerful quartz headlights, a long-distance viewing laser projector with optical telescope coupled to a TV screen in the cabin, an infrared beam with centrally mounted detector eye, sidelights and trafficators. The vehicle also boasts transverse gearing, independent suspension and magnetic brake drums which provide powerful controlled braking by means of electromagnetically generated opposing magnetic fields.Road/tyre friction heat at high speeds is countered by wing intakes, while a central housing and a rear-mounted fin maintain the vehicle's stability at speed. Safety air bags are fitted as standard.